The abundance and size of wild trout, as well as the abundance of organisms on which trout feed, are determined in large part by river flow and the physical and biochemical properties of the water (“water quality”). Fourteen U.S. Geological Survey stream gage stations (see map) and dozens of other gages on canals and reservoirs provide a continuous record of streamflow throughout the watershed. However, prior to 2014, our understanding of physical and biochemical processes such as sediment- and nutrient-cycling in the Henry’s Fork lagged far behind that of hydrology. That is why HFF launched a long-term water quality monitoring program in 2014. The goals of this project were to: 1) monitor long-term changes to important water-quality attributes in major river reaches and tributaries, 2) accumulate fine-scale data that provides the underlying chemical, physical, and biological context for interpreting results of site-specific research and monitoring, and 3) establish the capability to rapidly collect pre- and post-project data for the purposes of evaluating effects of new facilities and management actions. HFF has established a network of 11 water quality monitoring stations at strategic locations in the watershed. At each station, a sonde records data on temperature, dissolved oxygen, turbidity, water depth, total algae production, and dissolved organic matter every 15 minutes. That data is supplemented by weekly water samples, which are sent off to a lab for analysis of phosphorus and suspended sediment concentrations, two key parameters that cannot be measured by the sondes. 1. Dissolved Oxygen (DO) – DO levels remain good throughout the Henry’s Fork all year, with the exception of the bottom of Island Park Reservoir and Henry’s Lake. DO values tend to range from 6-10 mg/L in the Henry’s Fork. 6 mg/L is the state standard and >8 mg/L is ideal for spawning and rearing. 2. 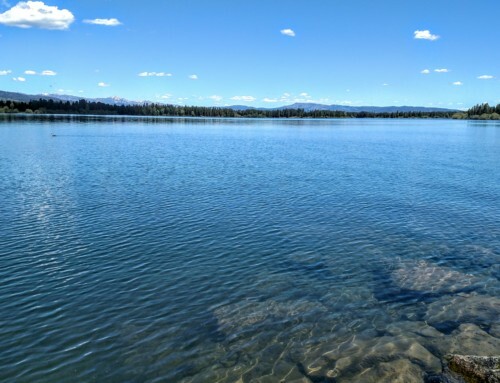 Water Temperature – Water temps are also generally good throughout the Henry’s Fork, with the exception of certain times of day and certain times of year at locations like Pinehaven and downstream of St. Anthony. 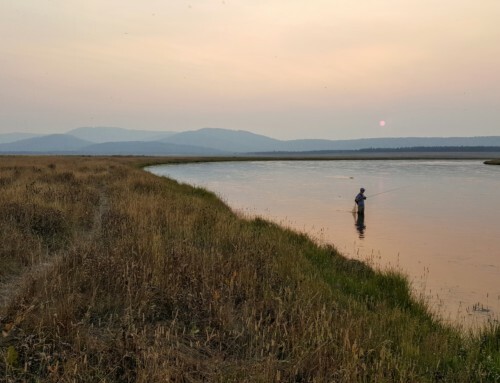 At times, we have been on the edge of temperatures that are outside the tolerable range for Rainbow Trout (<73 F) for a few hours on certain days, but consistently stay within tolerable range for Brown Trout (<80 F). Example of how water temperataures varied at three locations in 2017. 3. Turbidity — Turbidity is extremely low in the Henry’s Fork. Idaho DEQ’s standard is 50 NTU above background, which is about 4 NTU. The Henry’s Fork rarely sees anything over 30 NTU (during runoff in 2018, we saw ~27 NTU below the dam). Also, turbidity does not persist very far downstream of the dam. Those NTU values represent turbidity due to organic plant material as well as sediment. For example, turbidity will spike if a cyanobacteria bloom occurs and then dies and is flushed out of Island Park Reservoir. Observed turbidity in NTU (black dots) as a function of distance from Island Park Dam (IP Dam) collected during fall of 2016. 4. An excess of nutrients is not an issue in the Henry’s Fork except in Island Park Reservoir, Henry’s Lake, and below the dam. We have not observed any spikes in nutrients in the lower river due to increased agriculture on the landscape.